We all know the story of Michael Jordan being cut from his high school varsity team when he was just an underdeveloped sophomore. We also know that devastating blow was what initially willed Jordan to become the greatest basketball player of all time. 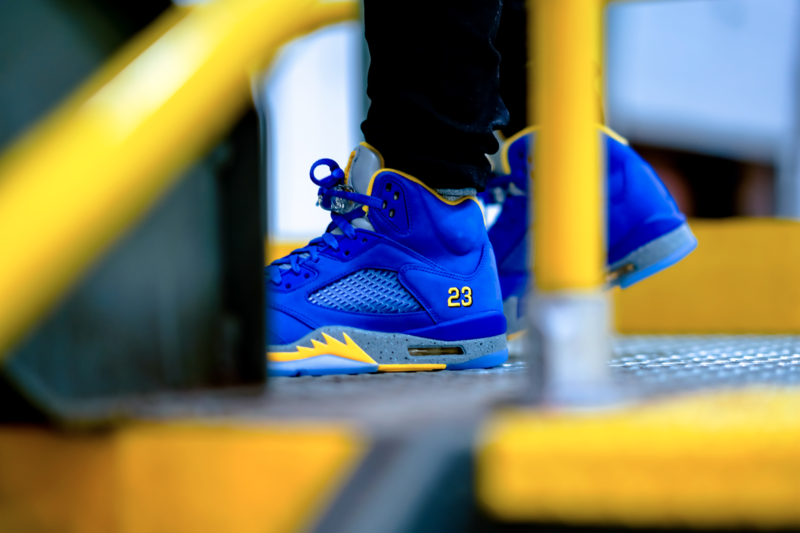 Both those defining moments took place at Laney High School in Wilmington, North Carolina. Back in 2000, Jordan Brand honored Jordan’s high school with an Air Jordan 5. 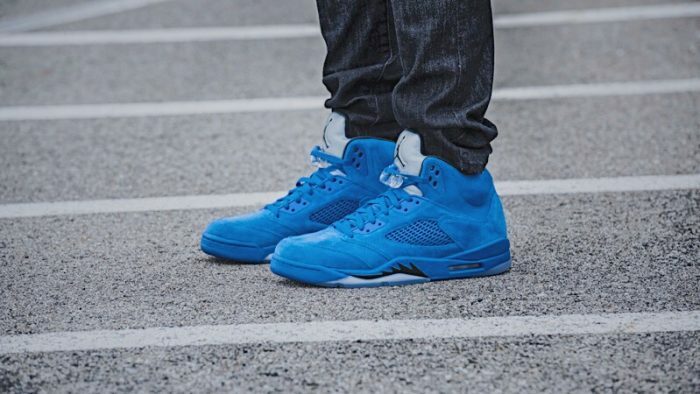 The shoe has grown to become one of the best non-OG Air Jordan 5s, and was retroed for the first time back in 2013. 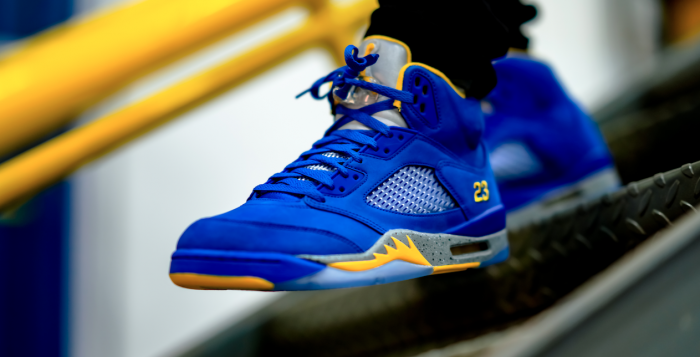 Now, Jordan Brand is starting 2019 by opening a new chapter for the Laney series. 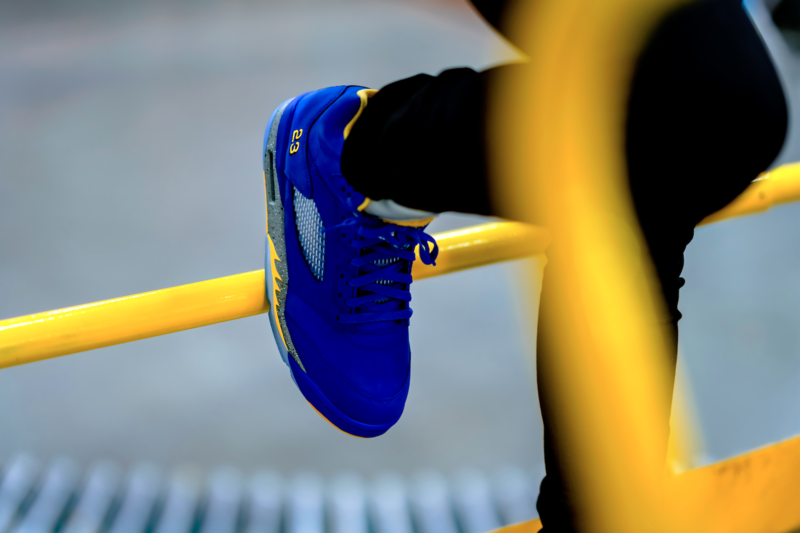 While previous Laney Air Jordan 5’s used a White leather as a base, this new color scheme dons a full-on varsity experience. 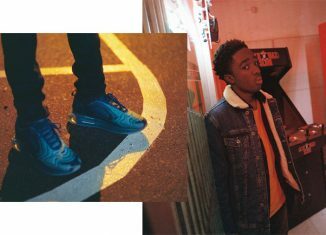 Now, this new makeup has Blue nubuck being served as the base color for the upper, while a speckled Grey midsole offers contrast. 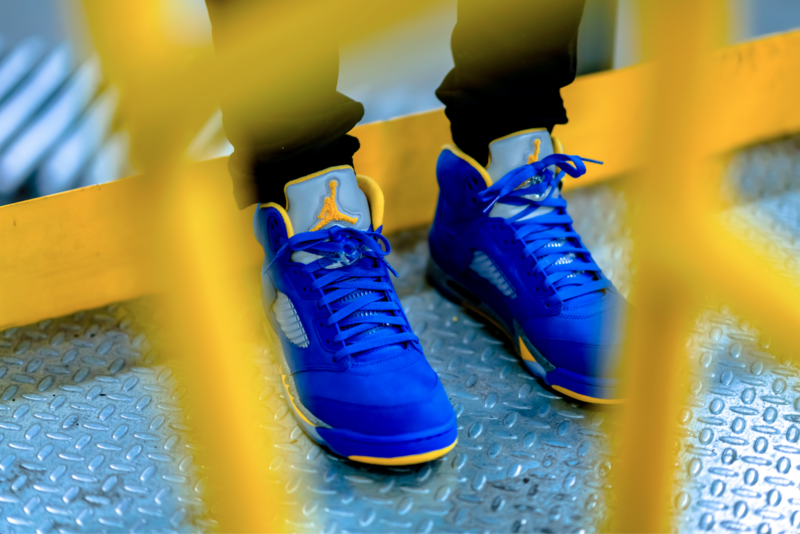 A Yellow chenille material, similar to what you’d see on a letterman jacket’s patches appears on the tongue’s Jumpman, heel “23” logo and the sockliner, and the look is rounded out by a translucent outsole with more Yellow and Blue detailing. 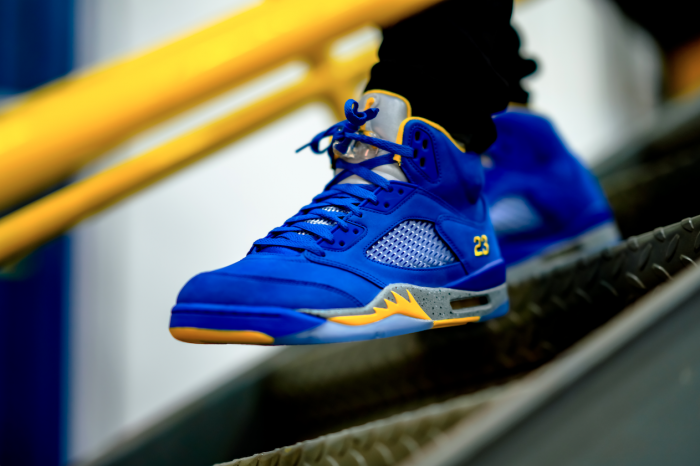 Grab your pair of the Air Jordan Retro 5 JSP ‘Laney’ on February 2nd at Finishline.com. Make sure you check with your local store for more release details. 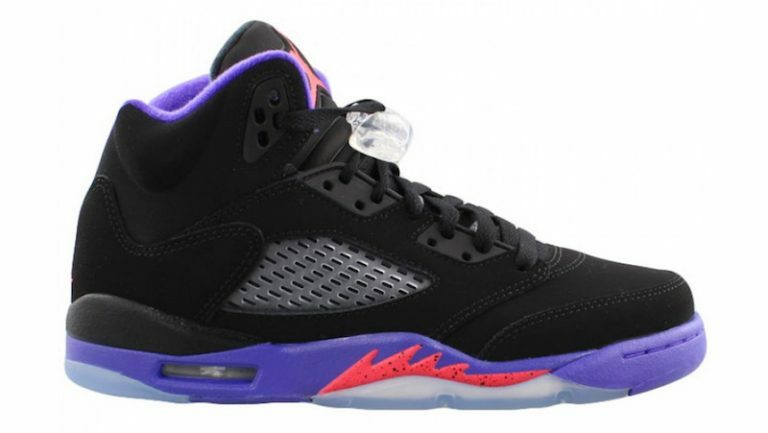 The up and coming Air Jordan Kids’ Retro 5 takes on a fun and bright new tone for summer. This new kids’ sneaker colorway features aqua, orange, and purple on the soles and tongues to contrast with the cool white tumbled leather upper. 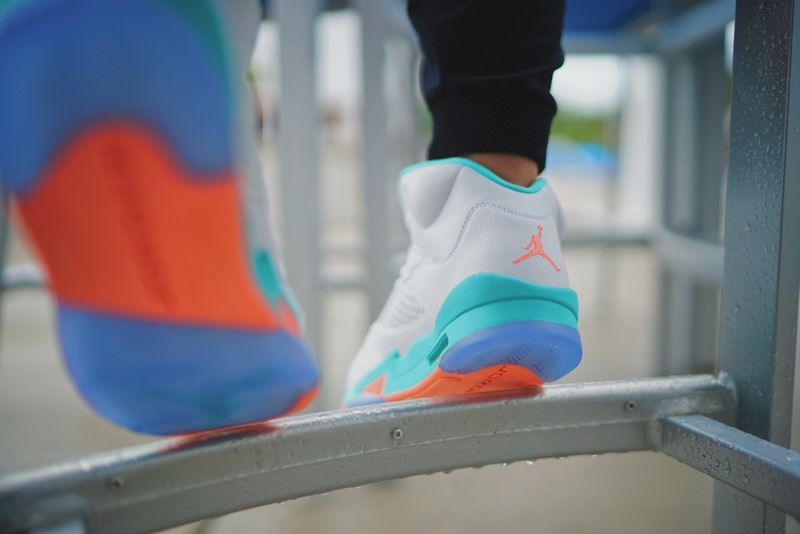 Completed with the Jumpman logo, it’s a fresh and bold retro style that will add the perfect pop to your closet for this summer. You won’t want to miss this! 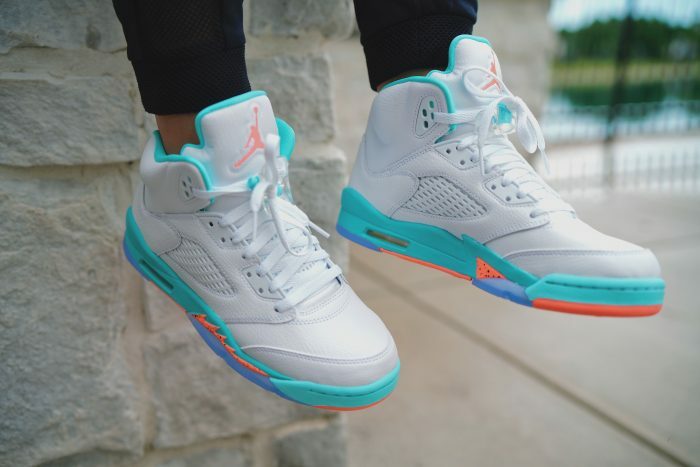 Shop the Air Jordan Kids’ Retro 5 in ‘Light Aqua’ on 7/14 at finishline.com. 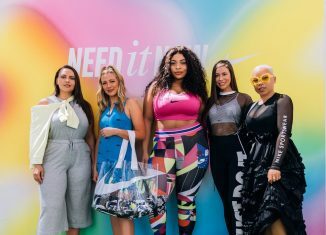 Ladies, just size down 1.5 for a great fit. As summer comes to an end and September has come and gone in a flash, Jordan Brand is finishing out the month with a super clean sneaker that your rotation needs. Back in July, JB dropped a Retro 5 in a clean all-red suede colorway that had sneaker lovers adding another red pair to the collections. 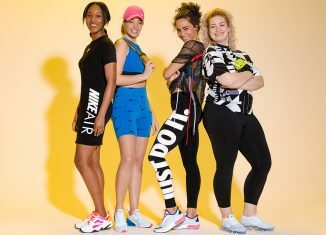 Now that we’re heading in to the fall and winter months, the styles are changing and so are the kicks. 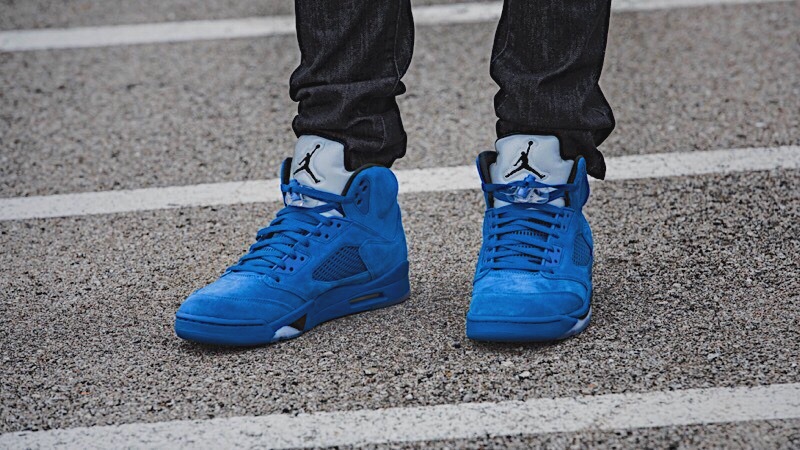 Meet the Air Jordan Retro 5 ‘Flight Suit East’ or ‘Blue Suede’. The perfect counterpart to the red ‘Flight Suit’ pair from July is here. 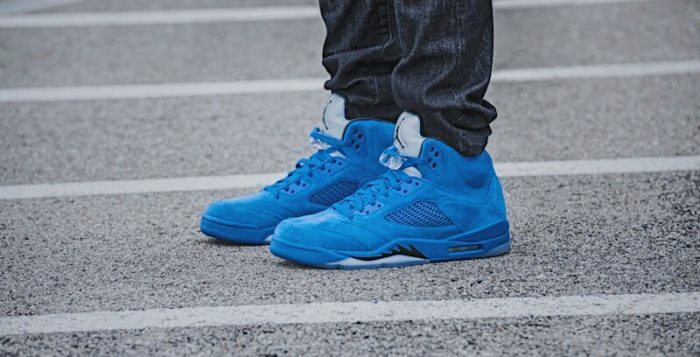 This new second “Flight Suit” themed colorway is inspired by the vintage Air Jordan warm-up suits, the blue hue dominates the all-suede upper with classic Air Jordan 5 characteristics. You’ll find complementary black detailing on its midsole while a contrasting reflective 3M makes its way onto the tongue in true Air Jordan fashion. 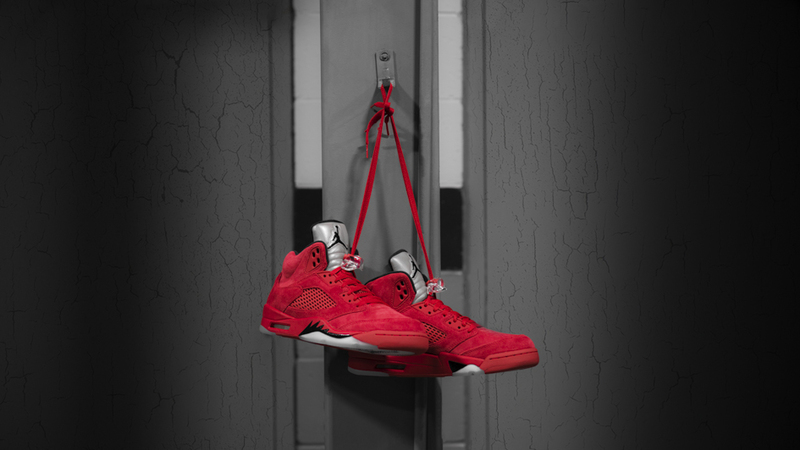 If you’re looking for that new go-to pair to give your all-red 5s a rest, then these are perfect for you. Grab your pair of the Air Jordan Retro 5 ‘Flight Suit East‘ on September 30th at Finishline.com. 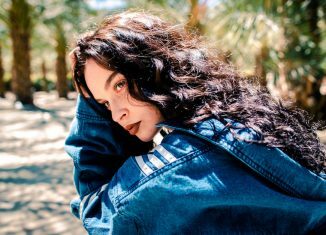 Camo colorways and designs are nothing new when it comes to sneakers, we’ve seen the ‘Fighter Jet’ Nike Foamposite One, ‘Country Camo’ Air Max Collection, and one of the most well-known, ‘Brian Anderson’ Nike Dunk SB. 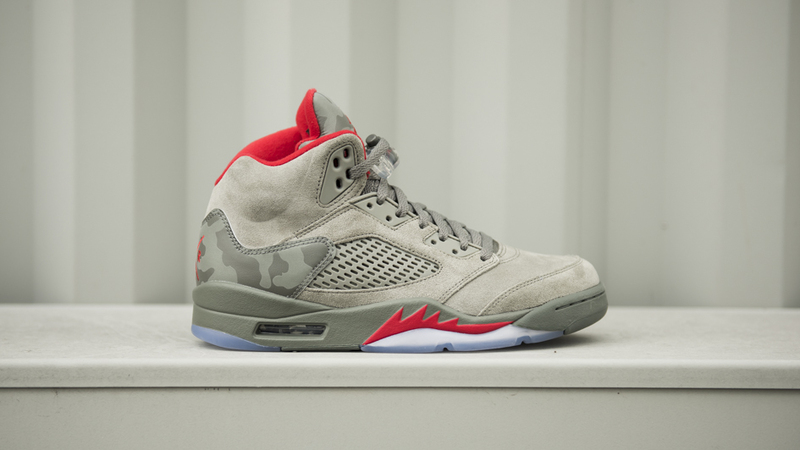 Now, Jordan Brand is embracing the Camo color scheme and they are giving the Air Jordan Retro 5 a special makeup. This brand new colorway is directly inspired by themes of the military, which is fitting considering the AJ V was inspired by the WWII fighter plane. JB is starting September off the right way as they are dropping the Air Jordan Retro 5 ‘Camo’ just in time for the coming fall months. 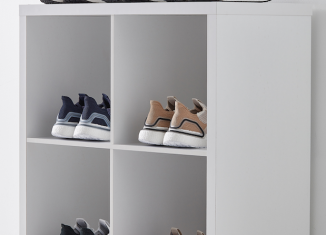 With this next retro being built in some new lifestyle colors, the sneaker comes with a dark stucco suede upper that includes fire red accents on the lining, branded tongues, midsole and its “AIR 23” logo on the heel. JB spared no creativity with the camouflage 3M Reflective detailing on the tongue and heel wrap that sits atop an icy translucent outsole. 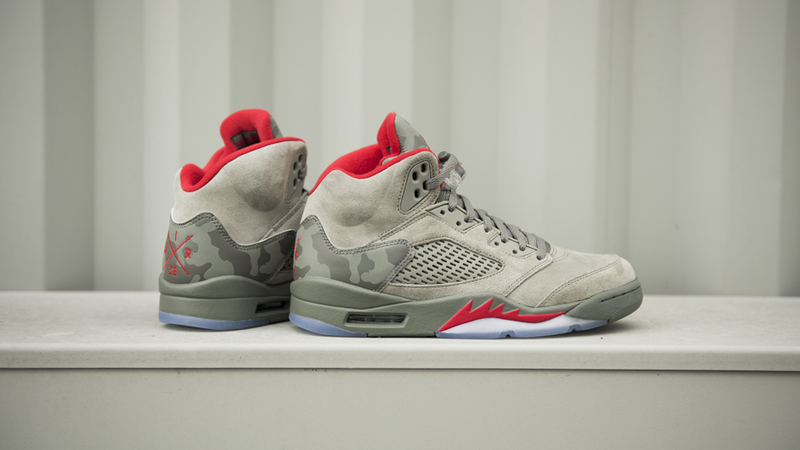 Make sure you grab your pair of the Air Jordan Retro 5 ‘Camo’ on September 2nd at Finishline.com. This isn’t the first time that we’ve seen an all-red Air Jordan Retro 5. Back in 2009, Jordan Brand dropped the ‘Raging Bull’ Pack that consisted of two pairs that sneakerheads went nuts for and is still considered one of the best Retro 5s to date. 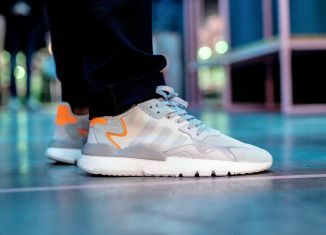 If you’re still dwelling on not being able to cop a pair of those, then get ready to add this next release to your rotation. All-red kicks have been popular for years in the sneaker world and this pair could push its way to the top of being one of the best. 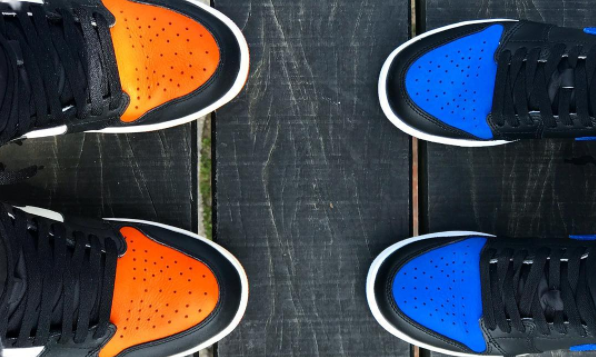 Either way, this release is starting July with a bang. The Air Jordan Retro 5 ‘Red Suede’ comes draped in a premium suede upper to match the red midsole and contrasting black shark teeth that are inspired by the old mustang fighter jets. 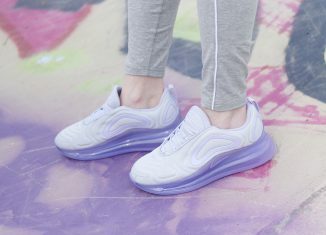 JB is getting a little experimental with this release thanks to a colored side panel netting instead of the traditional clear look that we’re used to seeing. 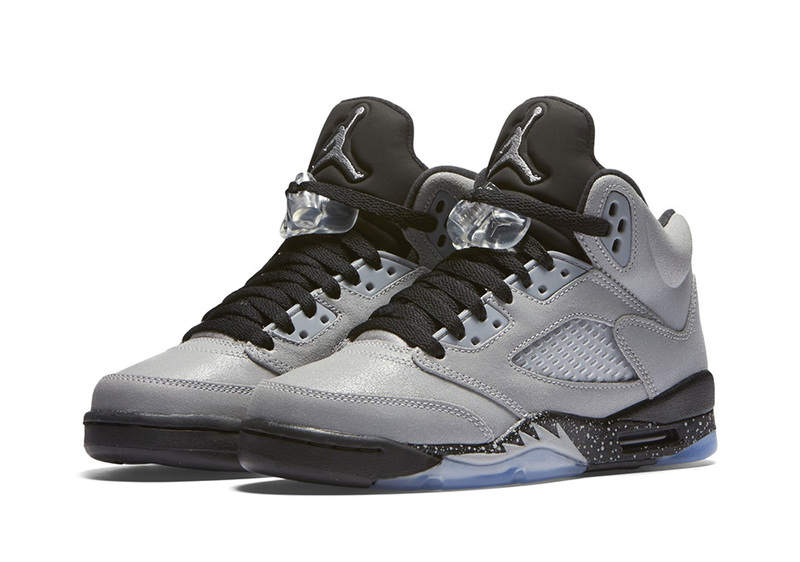 They did keep it classic with the ever-popular 3M tongue that has made the Retro 5 so special over the years. 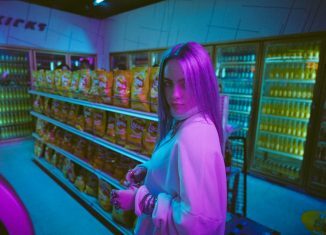 July is starting strong with this release and it is only going to get better. 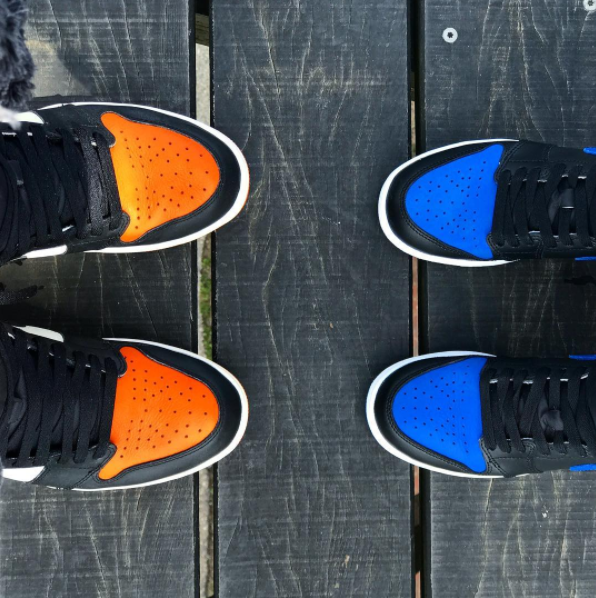 You can keep your whole family laced in a pair of these since they are coming in full-family sizing! 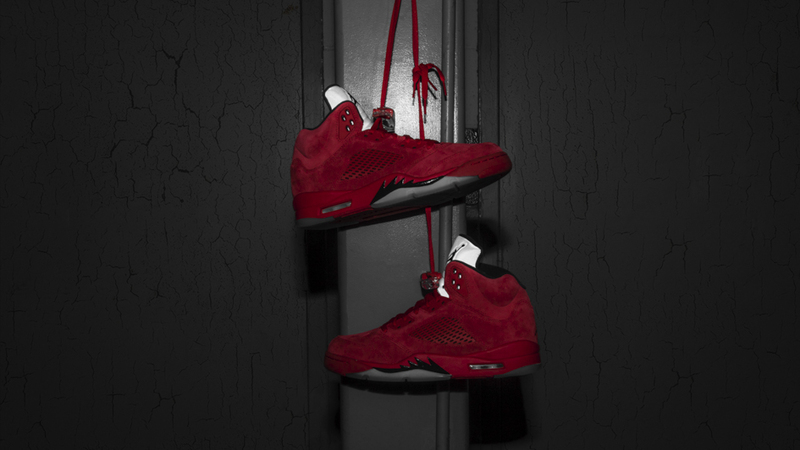 Grab your pair of the Air Jordan Retro 5 ‘Red Suede’ on July 1st at Finishline.com. 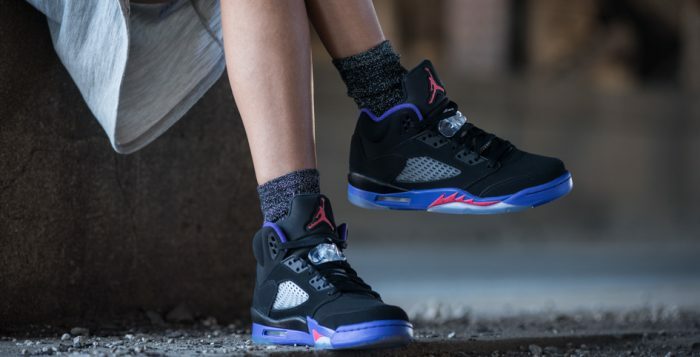 Another colorway for Retro 5 is coming for the girls. 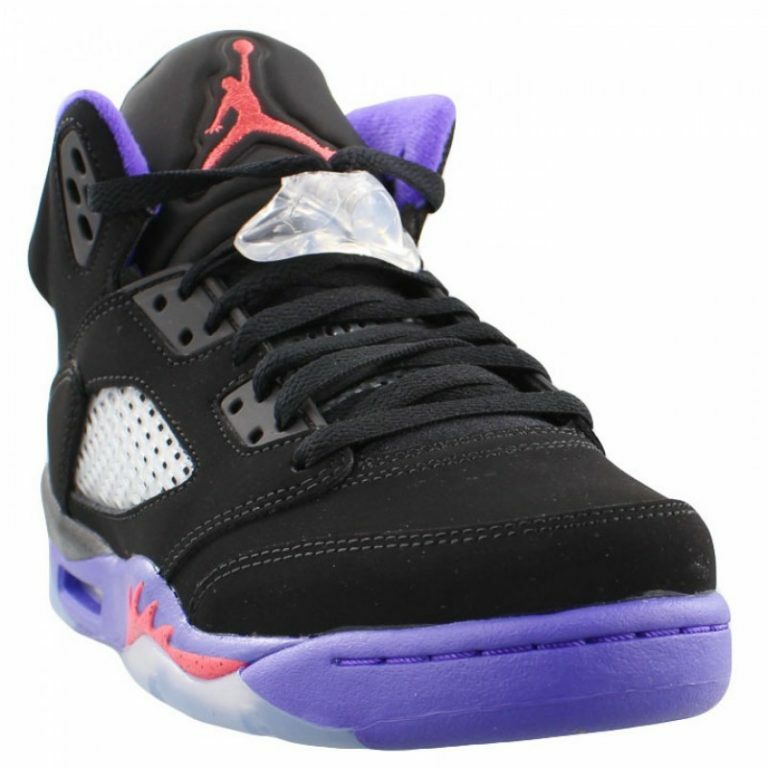 This time around, we’ll see a Black nubuck upper, a Fierce Purple lining and Ember Glow accents throughout. The colors are inspired by the former jerseys worn by the Toronto Raptors in the 90’s. With a smooth overall look you know your fit will be looking retro-fresh. 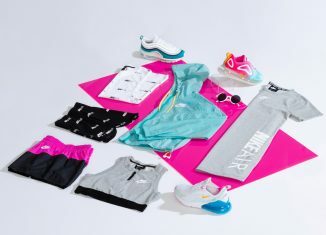 This exclusive colorway makes this drop a special treat for the kids, but ladies, you can also rock the latest, just size down 1.5 for a good fit! 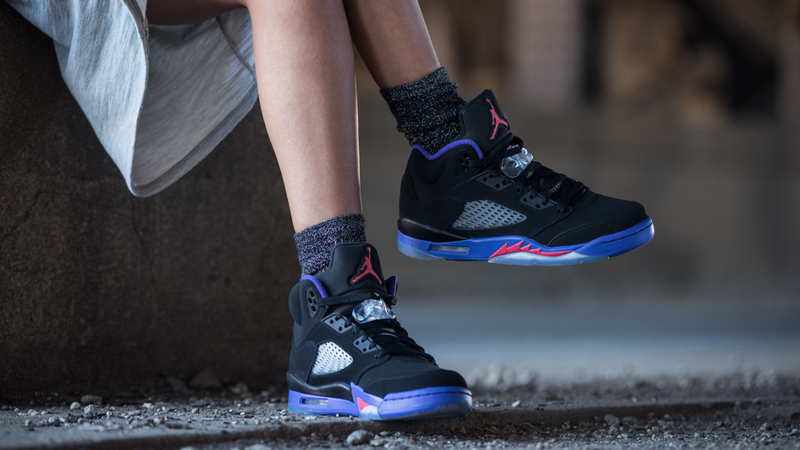 Keep your Jordan game strong and grab the Girls Air Jordan Retro 5 ‘Raptors’ Saturday, September 17th at finishline.com. 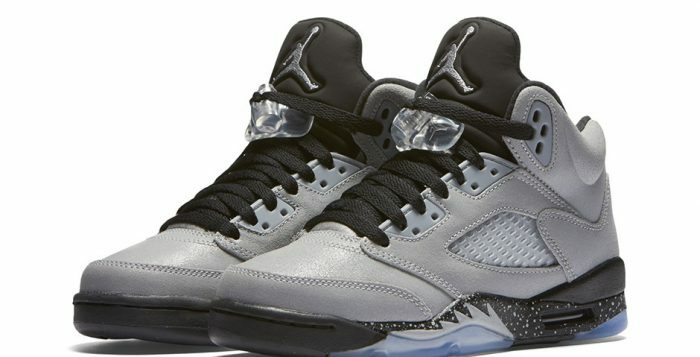 Wolf grey is back to play with another Jordan style. This Retro 5 colorway is exclusive for summer ’16 and we’re not mad at it. 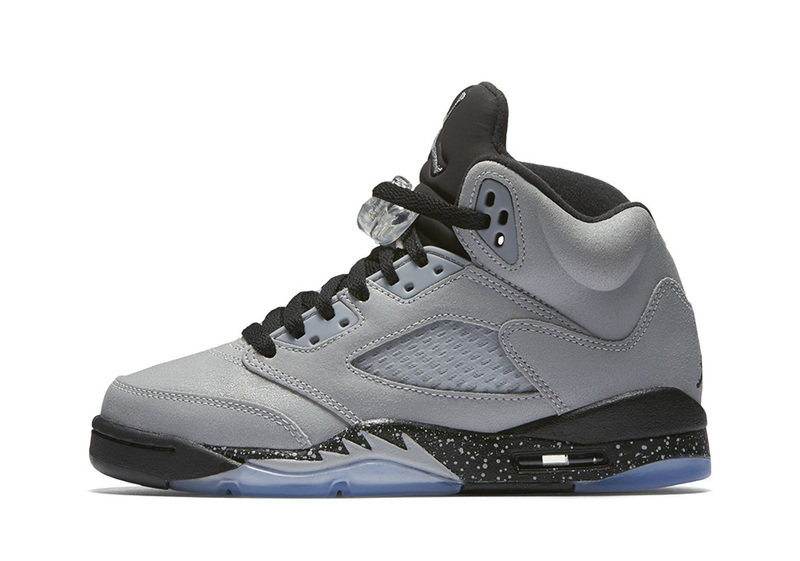 A clean Wolf Grey upper and Black midsole compliments the speckling and icy, translucent bottom effortlessly. Keeping you in neutral shades for the remainder of your summer and making it easy to style for day to day activities. 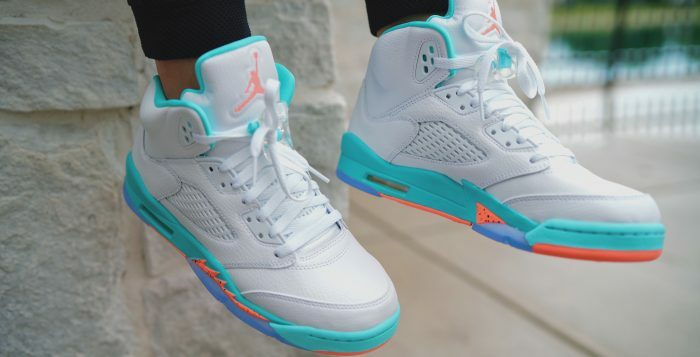 Jordan Brand didn’t want to leave out the kids with a new Retro 5 look and we have to say, they stepped up to the plate and delivered with this colorway. 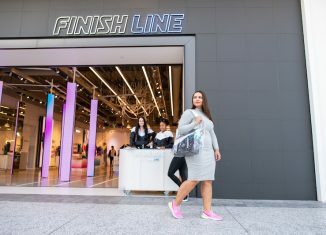 With summer coming to an end and the illustrious competition that has everyone glued to their TV wrapping up, Jordan Brand had to get in on the fun. So far this year, we’ve gotten some Jordan Retro 5’s that take us back to MJ’s glory days and a few that we wish he would have worn on the court. 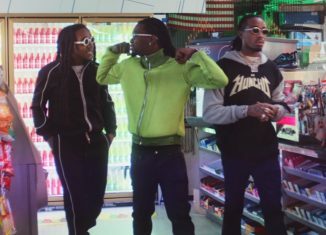 JB keeps bringing that heat this summer that have your rotation looking like Drakes. This pair gets decked out in a in a White, Black, and Metallic Gold Coin color scheme. 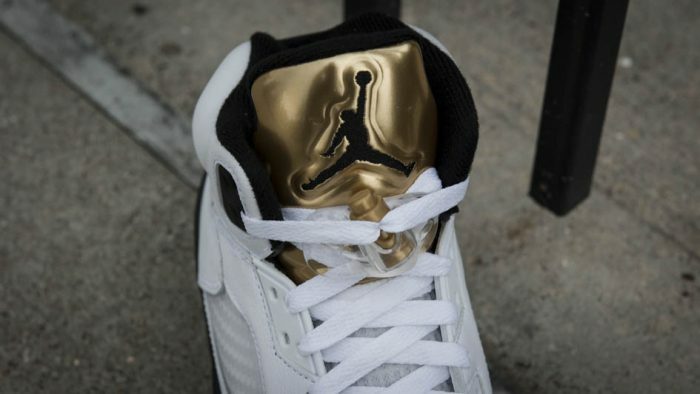 The shoe features a white leather upper with black and gold accents. 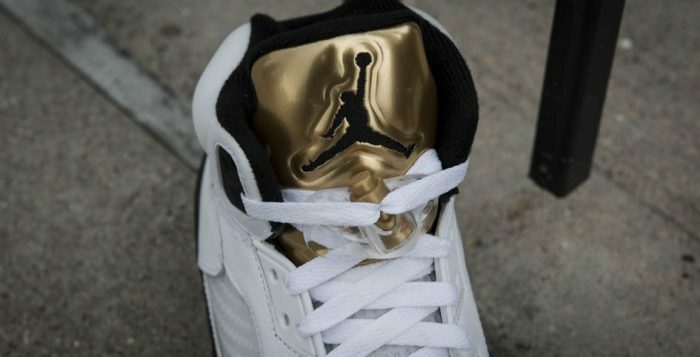 The metallic gold tongue will have people noticing your kicks everywhere you go. The finishing touches come in the form of a nice icy sole. You will feel like a champion every time you lace these up. 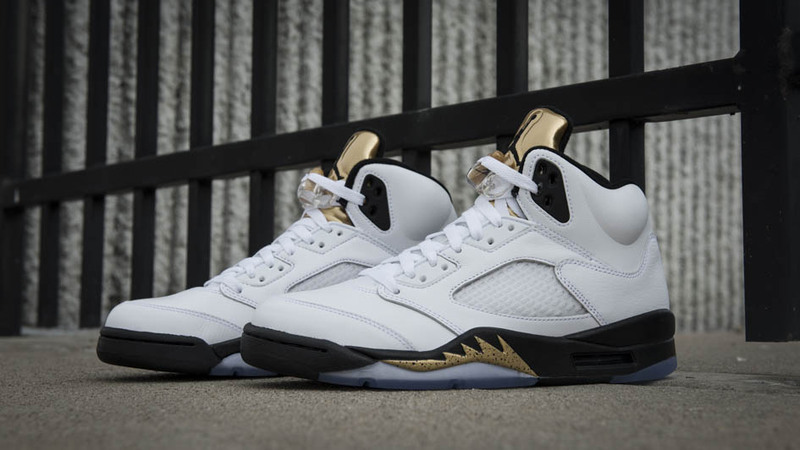 Pick up your pair of the Air Jordan Retro 5 ‘Gold Tongue’ on August 20th at Finishline.com.